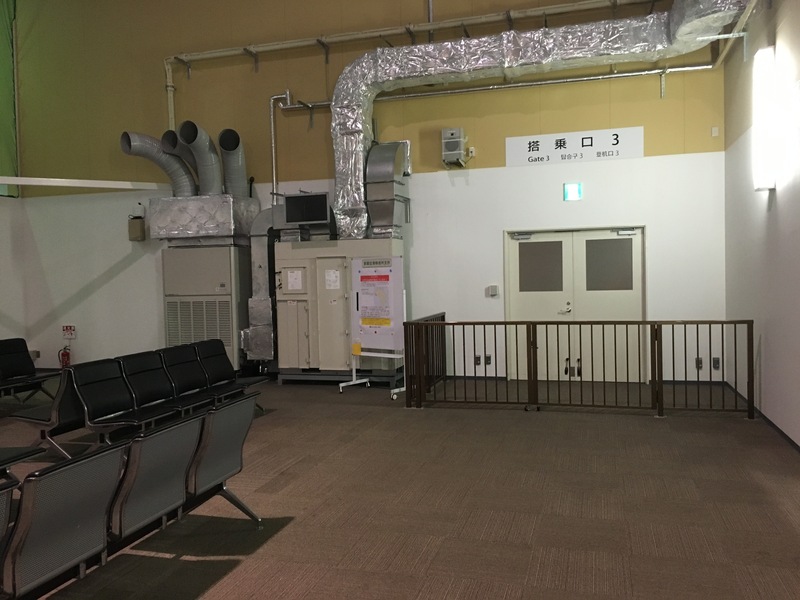 Don’t try to find the Peach or Vanilla Air gates at Naha airport (domestic and international). You have to pick up the bus at stop #4 which will bring you to the warehouse located in the cargo terminal. The bus is labeled LCC for Low Cost Carrier. There is a new concept of a LCC Airlines where it’s the Sam’s Club experience of flying. No frills, low overhead, simple terminals. Anti-Bourgeoisie, hard working, salt of the earth customers who just want to save every possible penny because any bit of excess is frown upon. Much like the David Ramsey message of simple living, you might find joy in making your travel one of personal sacrifice and not of any comfort at all. Well I spent this Thanksgiving wondering if this was clever marketing, or if you really save enough money to justify the experience (or lack thereof). 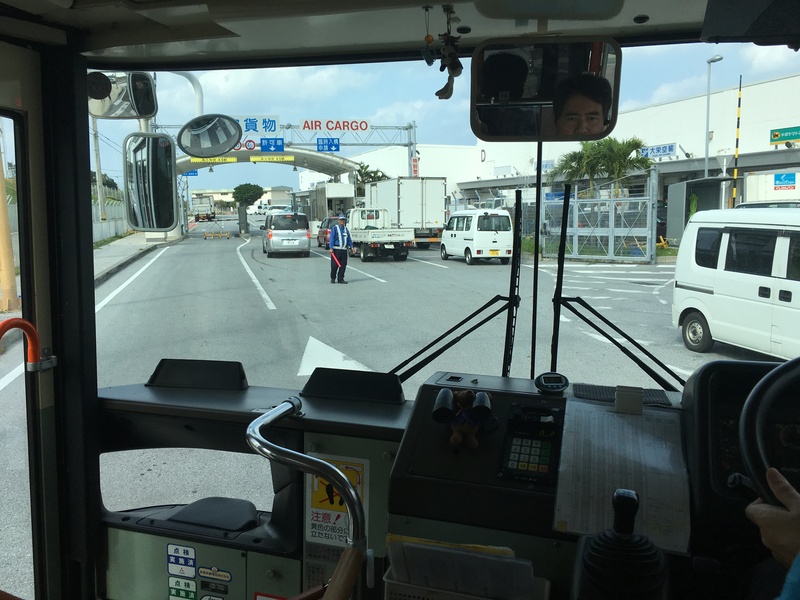 There is no other way to get to the cargo terminal besides the bus. The journey reminds me of Lethal Weapon 4 where Riggs finds the General’s personal army hiding out in the foreign trade zone by the docks. This is what the Hong Kongers see at there first impression of Okinawa. 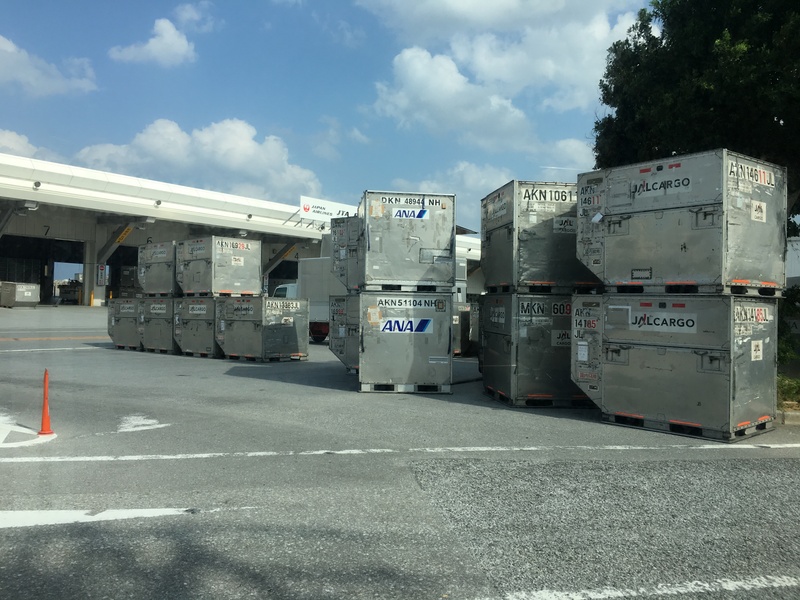 As they watch fresh tuna loaded on to aircraft cargo containers, they realize they might have made a huge mistake. Welcome to Okinawa! This is the inside of a refurbished cargo warehouse that they are now shipping the most annoying of cargo, cheapo passengers. So I won’t mind if I’m paying almost nothing to fly, but I had the sneaking suspicion that i’m actually PAYING A PREMIUM for this Spartian experience. Lets look at a trip to Osaka where both Peach and ANA fly to. We will compare services offered as well as cost from Naha to KIX (Kansai). Lets assume that we are checking a bag and we are using a credit card to book such a flight. Lets also assume you are a foreigner of Japan and are eligible for the experience Japan fare. ANA charges 10,800 JPY (any day) for one segment anywhere in Japan. So for this round trip OKA to KIX it’s $176.04 inclusive of all taxes and fees. This fare includes, picking your own damn seat, one checked bag (20kg/44lbs), one carry on (10kg/22lbs) a beverage (coffee, tea, beef juice etc…), lounge access if your *A gold or have the United Club Credit Card. Face value the KIX ticket on Peach is sometimes a mere 4,890 JPY (on wed), 7,090 JPY (Saturday) 13,890 JPY (Sunday) each segment. Lets assume you don’t give a crap about your time and fly out Thursday to Friday for 4,890 JPY for each segment. There is a tax of 360+410 JPY to bring your total to 10,550 JPY. 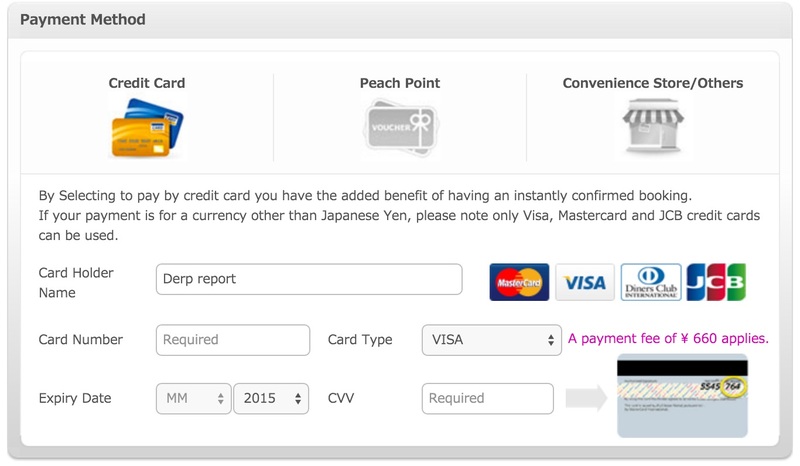 Then there is a payment fee of 660 yen to use an American Credit Card. 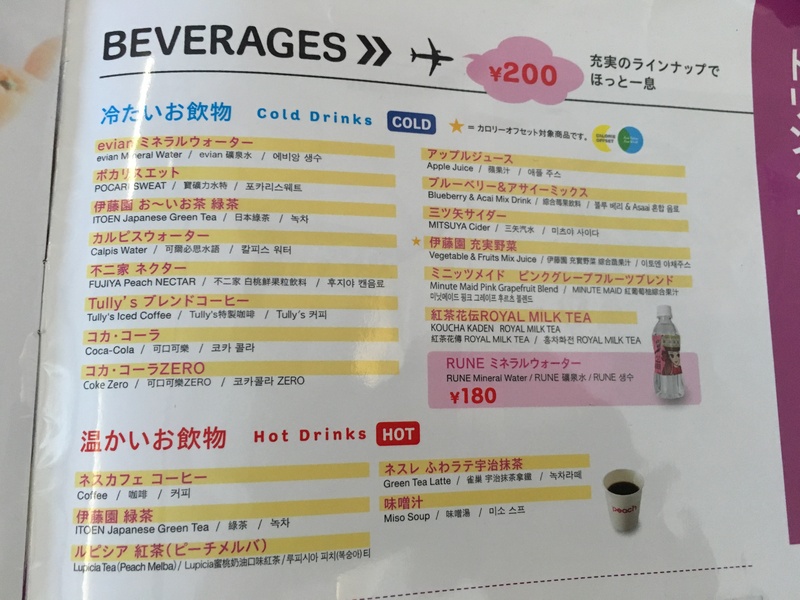 So total you get to fly for 11,210 JPY ($91.41) which is half the cost of ANA! Totally worth it in my book, but this is a not realistic scenario as I would have to take leave to fly out on a Thursday to come back on a Friday. Now lets assume this is a weekend trip, fly out Friday night after 1600 and return Sunday, and I check a bag since I want to export whiskey and handmade knives from Tsukiji market. So lets see where this becomes not worth it. 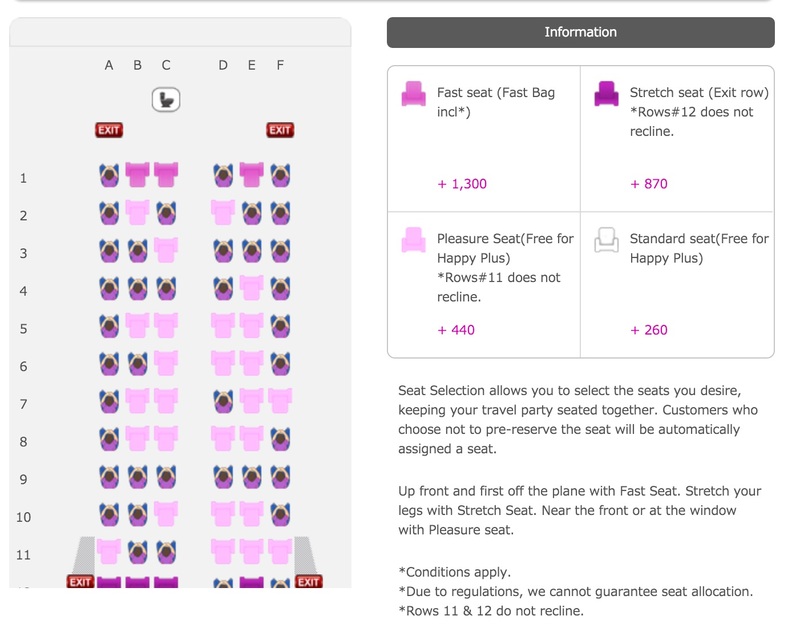 A bag is 1650 JPY each way, but if you book happy peach plus then you get a free bag, and you can pick a seat and not get stuck in the dreaded middle seat. we get the first segment for 7,290 JPY, but the return is 8,690 JPY, with taxes its 16,750. So let assume you are taller than 5 feet and would like some legroom, they have the emergency row for 870 JPY or the front row bulkhead with priority baggage for 1,300 JPY. This bulkhead is good with kids because it includes a bassinet for a infant to sleep in or a space for a child to run around in. So with the front row we now have a total of 18,050 JPY with a payment fee of 660 for a total of 18,710 JPY which is $152.67 saving you $30.15 over ANA! So yeah that is quite marginal in savings when you consider what else is missing. For one, regular terminal access is missing, thus not terminal amenities such as food or lounges. The bus adds 10 mins at least to your transit time both ways, and if you got to wait in line, it might addd up to 45 mins on both ends. 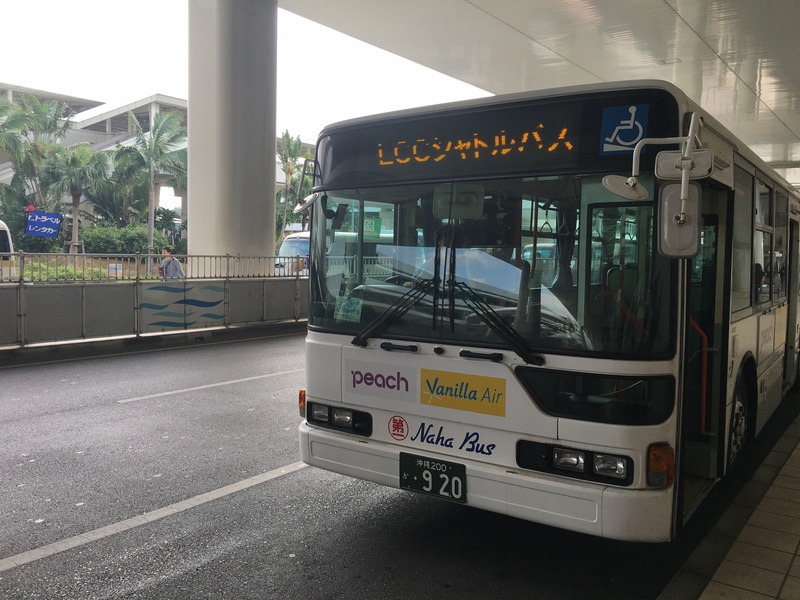 At KIX and OKA, the LCC is no where near the rest of the terminals, and you must consider an hour in your transit to and from the airport before connecting to regular transit. What is also missing is 150% United miles and segments which are valued at 2.3 cents per mile, and at 1110 award miles worth $25.53 a segment you are simply paying a premium ($51.06 in lost miles) to Peach to bang you knees into a reclining seat and to get shuttled from the cargo terminal to the rest of the airport. You may feel you are saving a lot, but at what cost? So bottom line, no luggage and no seat preference, go Peach, save 50% over ANA. If you like fancy folk things like checked luggage and terminal access, go ANA because your loyalty to the *A will be rewarded. Hey or do whatever makes you feel better about yourself. Just keep in mind that you might not be saving that much money when you are by the luggage room door thinking ther must be a better way to distribute luggage than by hand. PS: Full disclosure, this will be the last time I fly peach ever.